Some of you might be curious about our DW Dads logo with that yellow swirl in the background. Well, the DW Dads decided to feature our favorite Disney treat the “Dole Whip” in our logo. Since we consider ourselves both Disney World Dads and Dole Whip Dads – DWDads was a fitting name. The Dole Whip is a soft-serve frozen desert traditionally in pineapple flavor with a close relationship with Disney Parks. At one time you could only find this treat in Disneyland, Disney World and Hawaii. Today you can find copies at the local fro-yo shop and there are many online recipes to make this treat at home. You can even order the mix online or in smaller quantities on ebay. But for the DWDads, there is nothing like enjoying the original Dole Whip inside the parks on a bench in Adventureland, or waiting for a parade to start. You can enjoy the Dole Whip in a variety of flavors (pineapple, vanilla, orange, pineapple/vanilla swirl, or orange/vanilla swirl) and in a variety of ways (in a cup with a spoon, or as a float over juice). 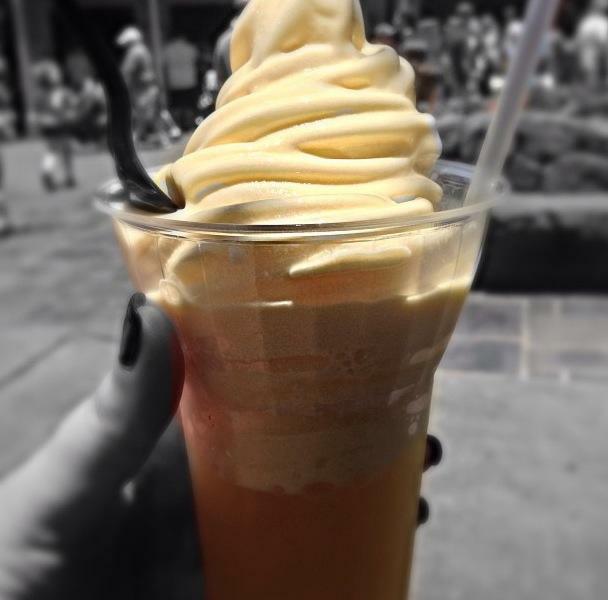 DWDads endorse the traditional Dole Whip float with pineapple soft-serve over pineapple juice as our go-to snack, though you should feel free to mix it up. This frozen treat is non-dairy because it’s a fruit puree reconstituted with water and then frozen. At only 80 calories for 1/2 a cup, this snack is guilt-free for those watching their weight. It’s refreshingly cool, which is wonderful when you are trying to catch a break from the hot humid Florida sun. It is fat free, cholesterol free, gluten free, allergan free and lactose free food, so most individuals can enjoy it without worry. 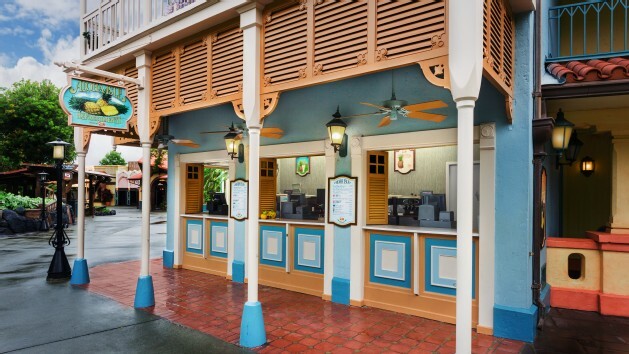 Another popular and similar treat to the Dole Whip that deserves to be mentioned is the Citrus Swirl, which can be purchased at Sunshine Tree Terrace (across from The Magic Carpets of Aladdin). 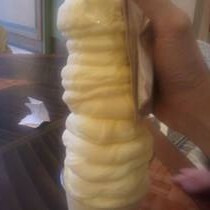 This cousin to the Dole Whip had a hiatus of nearly a quarter of a century before being brought back to the parks in 2012. The Citrus Swirl is a refreshing soft-serve ice cream blended with frozen orange juice. Sugar, Dextrose, Coconut Oil, Stabilizers (Cellulose Gum, Xanthan Gum, Locust Bean Gum, Karaya Gum, Pectin), Maltodextrin, Citric Acid, Natural & Artificial Flavor (contains Pineapple Juice), Modified Food Starch, Malic Acid, Beta Carotene (Color), Mono & Diglycerides, Less Than 2% Silicon Dioxide (Anticaking). Vegan Statement: The ingredients used in this product do not contain dairy, therefore, the product is considered dairy free. The Rabbinical guidelines classify this product to be kosher-dairy. Allergen control and sanitation procedures are in place and are strictly followed. In addition, this product does not contain any animal based ingredients. Fat Free: **Coconut oil contributes a trivial amount of fat. Thanks for turning me on to this J.R. It is so delicious and I did not know it was so Weight Watcher friendly. That is even better. Is it still available for 1 snack point? Yes – both the Dole Whip treat $3.79 and the Dole Whip Float $4.99 are both only 1 snack credit on the Disney Dining Plan (DDP – for those that speak in Disney acronyms).